My husband and I adopted twin boys born prematurely with a host of medical problems. 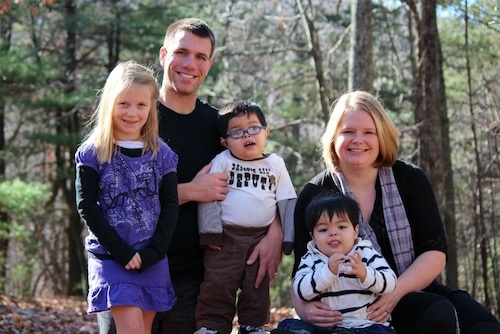 They were born with congenital cytomegalovirus (CMV) resulting in quite a few complex health issues. They both have hearing loss, environmental allergies, severe hypotonia, developmental delay, dysphagia, severe tracheolaryngomalacia, poor temperature regulation, dysautonomia, reflux, and a suspected undiagnosed genetic condition. Despite the long list of diagnoses, they are two awesome, happy three-year-old little boys who love Spiderman right now. They don’t talk but are able to communicate with the iPad. They are working on learning to move and we believe one day they will walk. Our long list of problems also came with a lot of specialists: neurology, pulmonology, gastroenterology, complex care doctors, audiology, ENT, Feeding Clinics, OT, PT, ST. You know the list. I broke up with most of them. They weren’t helping heal them. They just “managed” their long list of diagnoses. I traded them in for a good holistic doctor and our chiropractor. We still see our therapists and a small handful of specialists, but mostly, it is our holistic natural doctor and our chiropractor. Kaden had a GJ tube and now just has a G tube. While we practice natural medicine with all four of our kids, he is the most complex. He spent nearly his first year of life in the hospital and part of his second year as well. He seemed to catch every bug and just did not have the strength to fight off bugs like a typical kid. Simple colds meant another admission and stressful hospital stay. Our path down the road of naturopathic medicine started three years ago when Kaden had just been discharged from another bout of aspiration pneumonia and went in for a lung check. At this appointment, which also doubled as a nine-month “well check,” he was given four vaccines. He immediately began to react to the vaccines and went into respiratory distress. He was admitted to a PICU for six weeks as he recovered. His G tube was converted to a GJ and new protocols of medicines were given. To say the least, I was furious at the doctor for giving so many vaccines to a very sick baby at once. We were able to find a highly recommended doctor who I knew practiced more natural medicine. She educated and guided me on natural medicine and what would help Kaden thrive. It was a slow process transforming from conventional medicine to almost 100% natural and homeopathic treatment. Exasperated by our continual cycle of antibiotics, steroids, and hospital stays, I started an in-depth research of natural supplements that could help Kaden. I called the doctor and brought in my list of supplements that I thought would help Kaden. Together, we compiled a list of supplements and dosages that we would administer daily to Kaden. These were just supplements to manage his allergies, poorly functioning lungs, wheezing, and his reflux. In terms of general health maintenance and boosting immunity, our doctor recommends for all her patients a daily high quality probiotic to promote good gut health. Immunity begins in the digestive tract. We use Genestra HMF Neuro Powder. It is a powder that is great for all ages and for kids with G tubes. Another supplement we give is Vitamin D3. Most people are Vitamin D deficient. Vitamin D3 helps the body absorb nutrients and increases immunity, while promoting cardiovascular and joint health. The recommendation we follow is 35 iu/per pound of body weight for light-skinned kids and 50 iu/lb for darker skin tones. High quality, pure fish oil is also a great supplement to boost immunity. We also use Elderberry Syrup and homeopathic Aconitem Napellus at the start of any symptom of sickness. Elderberry Syrup helps boost immunity, decrease secretions and shorten the life of a virus. Aconitum Napellas, a homeopathic remedy, also shortens illnesses, if taken immediately at the onset of an illness. We have seen our kids go from being very sick and needing oxygen, to well in a few hours. We also increase our Vitamin D dosage for three days at the start of an illness per our doctor’s orders. Our kids who are complex are prone to antibiotic resistance. We have been able to avoid becoming resistant as we started using natural supplements in lieu of pharmaceutical antibiotics. Grapefruit Seed Extract is a potent supplement that we use for both bacterial and fungal infections. We have successfully used it to clear both Strep throat as well as thrush in his mouth, around his stoma, and on his bottom. We apply it both topically and ingest it orally or through the G tube. It tastes terrible, so a G tube is great for Grapefruit Seed Extract! Garlic is also a wonderful antibiotic. We use garlic drops administered as an ear drop in lieu of antibiotics for ear infections. Garlic drops CANNOT be given to a child with ear tubes or if the eardrum is perforated, thus we always ensure that the eardrum is intact before administering. After the finalization of our adoption when we were allowed to make medical decisions, we were able to add chiropractic care. A good chiropractor is extremely gentle with children and the adjustments cause no pain. If you imagine the skin of a tomato, an adjustment that a good chiropractor would make on a child would not break the skin of that tomato. It is safe for almost all children. An aligned spine helps boost immunity and improves neurological functions. It utilizes the body’s own ability to promote internal healing. It helps a child who is complex feel better physically. I can see a literal change in my boys’ demeanor after adjustments. They sleep very well after they are adjusted and are much calmer. I took Kaden to be adjusted during a particularly bad illness and he was on 4 liters of oxygen. He was adjusted and immediately began to cough up handfuls of thick mucus. On the ride home, he pulled off his cannula. His O2 sats remained high on room air and we were able to move on from the illness. Since the start of his regular chiropractic care, he has not needed steroids, antibiotics or oxygen. The twins also have had less frequent ear infections after starting chiropractic care. Our whole family gets adjusted every other week. Kaden still gets sick. He still wheezes at times. However, we have seen his tone increase since starting chiropractic care and he is now able to cough productively. Much of his illness is due to the inability to control his secretions. If he is having trouble with his secretions, we have him adjusted. Our wonderful chiropractor will see us quickly and has even offered house calls for when he is very, very sick. Thankfully we have not had to take her up on that offer. We have been fortunate to be guided by a wonderful doctor. It may take a bit of research to find a good natural doctor, but the benefits are more than worth it. Some parents use a naturopath and a pediatrician hand-in-hand. We were able to find a pediatrician who specializes in natural medicine but will also treat conventionally so we feel very blessed that we have her on our team. Many kids who are complex will benefit from the use of natural supplements, though children on TPN or with allergies would need special consideration by their specialists. Some supplements are not appropriate for some children with certain medical conditions and it is important that as parents we read possible side effects of each supplement, just as it is important that we do so with conventional medicines. By far, I have found that most natural supplements are extremely safe. A word of caution for G and GJ tubes, make sure that the supplement is well dissolved. We completely clogged our GJ with licorice root once. Many mainstream doctors are open to the use of Vitamin D, probiotics and elderberry syrup for illnesses. It is a very good place to start and safe for most kids. Talk with your doctor to see if it’s safe and right for your child. If you meet resistance that it is just “witch magic,” seek another opinion. Our journey in homeopathy and naturopathy has been life changing. I love sharing it with other parents because it radically transformed the quality of my kid’s lives! Abbey Clegg is most importantly a follower of Jesus. She is married to her awesome husband Rich and they currently have four sweet kids: Morgann, 7, Isaiah and Kaden, 3, and “Tot,” 1, who they hope to be able to adopt this year from foster care. They are foster parents to children who are medically fragile and are passionate about advocating for foster kids and their healthcare. She is also a La Leche League Leader. They love their church family, Virginia Tech football, the outdoors, and spending time together as a family. After working for three years in the healthcare industry, Abbey began to research natural medicine and started down the path of natural healthcare. Her favorite resources for natural healthcare are: http://icpa4kids.org/ and Mothering.com.